In operation for over a decade, Manzil has developed organically into a center for youth from local low-income backgrounds to improve their critical thinking skills, broaden their educational exposure, and explore extracurricular and creative talents. Flexibility, a family atmosphere, and the internal encouragement of leadership development are all essential ingredients of the Manzil experience. 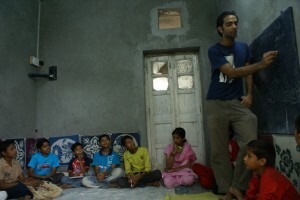 With the anticipated move of founders Ravi and Indira Gulati to Dehradrun, the Manzil home and community center is approaching a phase of transition: management and administrative responsibility will be transferred to a handful of student leaders, who are themselves products as well as facilitators of Manzil’s unique philosophy and design. My fundamental task is to prepare this transition and to establish a sustainable management structure that is sensitive to Manzil’s organic processes while also identifying potential improvements. I have organized my work at Manzil into four general phases, which are loosely aligned temporally. The first phase, Orientation and Integration, requires that I become familiar with Manzil’s staff, students, projects, and procedures and actively engage in classes, assignments, programs, and excursions; while the initiation of this phase occurred at the very beginning of my fellowship year, it also continues throughout my time here as I am continuously involved in the classes and programs at Manzil and always gaining new insights. In the second phase, Structural Development, I identified current effective management and administrative practices and outlined a supervisory structure; in so doing, I was able to recognize which areas in Manzil’s operations were strong and where there was need for improvement, and, while incorporating the input and feedback of the current administration and other concerned parties (such as the teachers), I proposed a new structure for Manzil’s leadership with detailed descriptions of individual and communal duties and responsibilities. The third phase of Implementation is where I am now, as we fill the new positions that the new structure demands, train those individuals for their roles, and communicate all these adjustments effectively and consistently. The upcoming fourth stage, Evaluation and Adjustment, will require that I take a step back to assess the implementation and operation of the new structure and initiate the necessary adjustments accordingly; at the same time, this last phase requires that I begin to prepare for my own departure, a mini transition in its own right, so that those regular responsibilities that I have assumed in Manzil’s daily operations will continue successfully without me. Overall, I am very pleased with the execution of my project plan. The most significant, and in many ways the most challenging, component of this has been the implementation of the new administrative structure and, in particular, the hiring and training of the new Student Coordinator, one of the three crucial positions at the top of the new structure and the only one not naturally filled by a student leader working in Manzil’s administration at the time. After reviewing my proposal (essentially, a document describing position responsibilities and a corresponding visual chart of the new leadership structure) with the Manzil Core Group, which at the time consisted of Ravi Gulati, the founder of Manzil, and Anish and Anil, two student leaders and the two most involved individuals in Manzil’s administration, we translated the documents into Hindi (no simple task) and went to the teachers to gather feedback. We set aside two consecutive meetings with the teachers (of which there are just under twenty) and explained the proposal, subsequently answering their questions and asking for their input. After considering their feedback and incorporating some of their recommendations, we posted these documents on the public Notice Board for all Manzil students to review. Transparency and effective communication were always objectives that I felt were essential for this process. Anish and I arranged to speak in every class about the proposal; I even used the English version of the documents in the English classes I teach as a dual-intentioned exercise. Then, the next step, and essentially, the first step for Implementation was to hire a Student Coordinator. In a process quite novel to the Manzil community, we held an application and interview process. The application committee consisted of the three Core members, me, and two people outside of Manzil’s day-to-day operations who understand the organization well. We gave prospective applicants two weeks to apply and actively encouraged active and able students and potentially strong candidates. In the end, we had six applicants, a number greater than I ever expected and a pool with which I was reasonably pleased. Some drama aside, our new Student Coordinator, Anju Gupta, started work on January 1. Since then, we’ve focused on training our new Core member, and Anish and I, in particular, have been very involved in this process, holding meetings with her every morning and assisting and evaluating (more closely than I would have anticipated) her daily tasks. Other steps of the Implementation phase have begun; for example, we have selected Subject Coordinators, positions that are designed to work closely with the Student Coordinator as the closest link to the Teachers, and are running essentially a three-month pilot program for assessment purposes. Implementation continues, and my work is most certainly cut out for me in the next phase of Evaluation and Adjustment. The most significant goal that I am working toward is the confidence that when my fellowship ends, if the Gulati family were to leave Manzil at the same time, the organization could continue to function and pursue its mission well. Being my primary concern, I feel I have addressed, and am pursuing, this objective conscientiously through the four phases. In addition to this goal, another set of considerations have appeared. In my first month at Manzil, in an effort to provide Anish more freedom and less stress to execute his primary role as Chief Coordinator (a title not defined previous to the new structure I proposed, but one that would still be reflective of the direction his responsibilities were headed before I arrived), I had agreed to take on his English classes. Now, many months later, I have become quite comfortable with these classes and have discovered quite a lot about effective teaching skills, styles, activities, and techniques, in particular for these groups of students and within this unique environment. The challenge now becomes transitioning myself out of the system and ensuring that this knowledge and newly-cemented class character continues with a new batch of student-teachers, whom I am currently training. My goal is that these student-teachers, with the assistance of some volunteers whom I have also mobilized for this effort, will become confident, capable, and excited to continue Manzil’s English classes in the ways that I have been these last few months. The truth is that I have learned so much from this year, much more than could ever reasonably fit on a document of this nature. So, to be more brief – and perhaps, more reasonable – I will be a bit general. This has been my first visit to India. As both my parents were born in Africa and neither side has much family living here, there had seemed to be little reason to come in my youth. But, over the last few years especially, I have recognized a growing personal desire to come here myself, and most importantly, to come not as a visitor or a tourist, but as a resident and a positive contributor to society. Having traveled quite a bit and lived and worked abroad previously, I felt I had fair comparative expectations for the year. But India, I have learned, is not just another country like the Netherlands or Austria or even Russia. India is another century. India is another civilization. India is another universe altogether. And, although it can look the same at the superficial level – as so many love to point out with irritating admiration, the West has arrived (!) with its jeans, its mobile phones, its A/C, and its general overconsumption – that other vast and great universe cannot be completely veiled. And through these peeks (the children in my colony playing with marbles or a maid’s utter confusion at my not being married or the local auto mechanics telling me with silent gestures and wobbling heads that they admire my mustache or an elder seeking to motivate a youth through long-winded negative reinforcement or the neighbor’s daughter not accepting that English is my native tongue or any one of the thousands of assumptions that my students reveal to me often unintentionally and sometimes unknowingly), maybe I don’t quite yet understand. But I begin to understand. Honestly, I have (and could have predicted that I would have) trouble answering a prompt such as this. Perhaps some third party could tell that I have changed significantly in this year or perhaps even I in a couple years will be able to say the same, but I do not feel I can satisfactorily evaluate how I have personally grown in the past few months. I know that I have physically shrunk, and I would not be surprised if nine out of ten family members and friends plus Amrit-version-20XX would say that I have grown mentally or spiritually, but all I can say is that I have a folder full of journal entries, pocketbooks full of personal notes, a head full of new ideas and perspectives, and memories full of experiences from this year. I will never let go of these nor take them lightly. Wow, that was a amazing job!